The terms "multimedia" and "personal sound system" usually conjure visions of plastic speakers, exaggerated power output, one-note subwoofers, and overall sound quality rivaling a cheap clock radio. Regardless of music played, multimedia sound systems all sounded the same: tinny, flat, and lifeless. Computer users have complained for years about the poor quality of audio components designed to work with their machines. 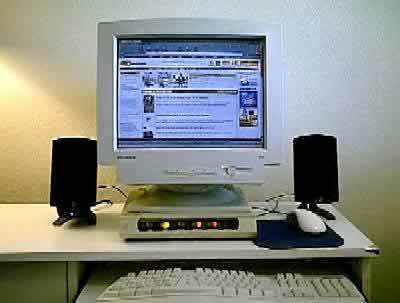 Those who had the ambition usually connected their computer sound output to their stereo systems. However, this solution was far from perfect. Home stereo speakers generally are not magnetically shielded, so they had to be kept away from the monitor, and the stereo components were bulky and added complexity and heat to the workspace. Additionally, many controls were located on the stereo system, not on the computer where work (or play) was being accomplished. The obvious solution was for a company to produce a high quality sound system for use with a computer or other personal audio device, such as a portable CD or MP3 player. In the past couple of years, several companies have begun marketing such systems. Some of the new high quality personal audio systems are being produced by startup companies, and some by computer accessory companies. Enter: Klipsch. For people who think lightweight, plastic speakers are normal, and who think speakers are supposed to sound tinny, Klipsch will be a new name. For anyone reading this review, Klipsch is well-known and much-respected for its audio products. They have been in business for over 55 years. While Klipsch is continuing to produce the home and professional audio products that made it famous, the company recently decided to branch out into multimedia products. 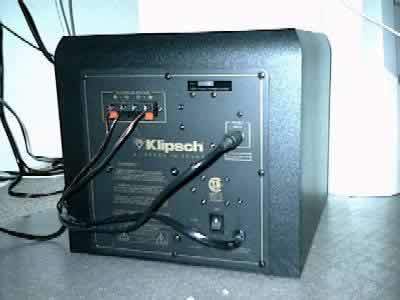 Klipsch saw a vacant niche, that of producing high quality sound components for computer multimedia and personal music devices. The company realized there was little competition, and decided to fill the void by approaching the problem of quality computer sound output by using their own audio expertise. The Klipsch ProMedia 2.1 is the latest in a new line of multimedia systems designed by Klipsch for the personal sound system market. This market includes not only computers, but MP3 players, mini-stereos, boom-boxes, video game consoles, and any other products that use a mini-stereo output plug to send an analog sound signal to a sound system. One specification of note with this system: the ProMedia 2.1 is certified by Lucasfilm to be THX®-compliant. The THX-certification for the ProMedia system includes: "natural frequency response (in-room) of 31-20,000 Hz; controlled directivity for accurate spatial imaging and precise sound localization; broad dynamic range and low distortion design for unstrained high output sound reproduction (+105 dB)." This certification is almost unheard of in computer multimedia sound systems. However, the THX-certification will become quite common in the near future as more companies realize that computer audio should be compatible with the rest of the multimedia package. At first appearance the ProMedia 2.1 system doesn't look much different than other three-speaker systems available for computers. 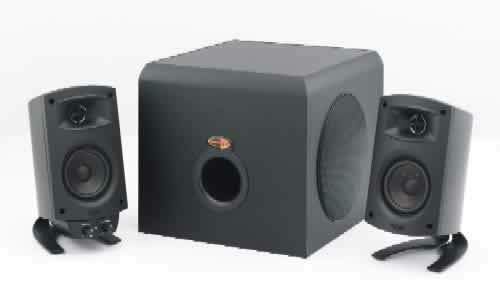 Two medium-sized, shielded, satellite speakers designed to flank the monitor, and a box-shaped, subwoofer intended for floor placement comprise the system. Fortunately, unlike most computer products, these speakers aren't beige or off-white, they are black. The satellite speakers are sealed, elliptically-shaped units that are made of high impact polystyrene (yes, yes, it is a type of plastic). The satellites are dense, solid, and surprisingly heavy for their size. They stand about 22cm (9 inches) tall on removable stands. The elliptical shape of the satellites is designed to prevent internal reflections and standing sound waves from interfering with driver output. The high-frequency sounds are handled by a 19mm (0.75-inch), polymer dome tweeter that is set in Klipsch's trademark Micro-Tractrix horn. The mid-bass driver is a 7 cm (3-inch) diameter, long throw design with a fiber-composite cone and black urethane surround. According to Klipsch, driver materials were selected based on reliability and durability, which were crucial to the design of the satellite speakers. Separate subwoofer and main system volume control knobs are located on a control pod, which is attached to one satellite speaker. The separate controls allow a user to tailor the amount of bass to their particular taste. In addition, a headphone jack and a secondary line input (both are 1/8-inch stereo plugs) are located next to the volume controls on the side of the control pod. The subwoofer contains a 16 cm (6.5-inch), long-throw driver in an MDF (medium-density fiberboard), ported enclosure. The enclosure measures about 25cm (10 inches) square and 22cm (9 inches) tall. The subwoofer incorporates the driver into a sixth-order, bass reflex design. According to Klipsch, the subwoofer has "high acoustic output and low distortion bass while minimizing driver excursion"; the subwoofer was designed to provide powerful bass over a wide range of frequencies. This design should reduce the dreaded "one-note bass" so common to computer subwoofers and other cheap subs, such as those frequently heard booming from mini-trucks in American cities. The "control pod" plug and speaker output connectors are located on the backpanel of the subwoofer. The subwoofer incorporates neither a variable frequency low-pass filter nor a variable phase control; because the ProMedia subwoofer is designed to be used only with Klipsch satellite speakers, these features are not needed and would only increase the cost. The system amplifier is contained within the subwoofer enclosure. This solid state unit is, according to Klipsch, a "Digital-Linear Hybrid, three-channel amplifier that utilizes discrete, linear output transistors (MOSFET) and a high current power section." Klipsch rates the output at 200 watts maximum for the system: 35 watts per satellite speaker, and 130 watts for the subwoofer. Setting up the ProMedia 2.1 was reasonably intuitive. Adequate explanation for properly connecting the three components is located in the pamphlet provided with the ProMedia package. The hookup is simple enough that little explanation is necessary. The ProMedia package includes everything needed to connect the system to a computer or to other devices; no additional parts need to be purchased. The ProMedia 2.1 has a surprisingly rich, natural sound for such a system. Musical presentation is lively and immediate. The ProMedia can fill a small room with sound effortlessly. If care is not used with the volume, it can also overpower a computer workspace causing a decline in productivity as the listener slows work in order to listen. On the other hand, it can allow a gamer to become as immersed in the sound as he is in the visual and gaming aspects of his passion. ProMedia 2.1 installed on test computer, with removable grill covers in place. For some people, 35 watts for satellites and 130 watts for a subwoofer may seem inadequate. However, unlike highly overrated power specifications for some computer speaker systems, Klipsch has provided power output ratings that seem reasonable. The specifications claim 106dB maximum sound output. Over 102dB was measured with system volume well below maximum; this claim seems accurate. The ProMedia 2.1 can play sounds from a soft whisper to high volume from the same track without having to adjust the volume control. This ability to play sounds over a wide dynamic range is provided by the internal amplifier, which delivers more than adequate power. The Klipsch system bass is deep, flexible, and powerful. The ProMedia avoids the most common pitfall of many subwoofer designs: this system plays back a wide range of very-low, low, and mid-bass frequencies covering the spectrum from under 35Hz up to its advertized 20kHz. Mid-range frequencies, which include sounds within the normal range of the human voice, are clean and clear. Male voices did not have the "chestiness" so common with inexpensive stereos; female voices didn't sound nasal (except for singers who were nasal). There is no apparent muddiness or tinny sound from the satellites. High frequencies are also clean, clear, and easily heard. Music played through the Klipsch ProMedia system has a more musical sound and a livelier "feel" than music played through any multimedia sound systems I have yet auditioned. The ProMedia sound output is good enough that the quality of computer sound card and musical source (MP3, CD), affects the quality of output. This usually cannot be said of sound systems designed for computers. Sound effects from games and movies are very impressive. The user who wishes for movie or game explosions that will "rock his world" will be hard pressed to find a better, amplified three-speaker system for the money. In small rooms, it is easy for the ProMedia to overpower the listener if the volume is set too high. Three-dimensional sound effects are also very impressive. On the computer test, the ProMedia 2.1 was matched with a Turtle Beach Montego II sound card to test 3D effects. This combination delivered unexpected depth to the soundstage. Not only was stereo separation between the two satellites sufficient to allow sounds to be easily located in space left to right, but there was sufficient depth to the apparent soundstage that sounds could be located in the three-dimensional space between the wall and the listener. This effect was not very noticeable with music, but was quite effective for sound effects. The 3D effect was quite impressive for a three-speaker system; it just didn't translate to music well. The satellite speakers sometimes sound a little bit closed in, as though they are playing in a box. This becomes most noticeable when playing orchestrated music, but can also be audible during vocal and acoustic music. The effect is present, though not overly pronounced. Musical detail is adequate, but it is lacking definition compared to a high quality sound system. In addition, it seems as though the 7cm mid-bass drivers are not carrying enough of the mid-bass; the sub-woofer seems to handle frequencies higher than it should. The result of this is that some directional information in mid-bass seems to be lost to a single driver. In addition, there occasionally is an audible changeover in sound source location between the satellite speakers and the subwoofer. However, in all fairness these criticisms can only be directed at the ProMedia 2.1 when comparing it to a high quality stereo sound system, a comparison that is unreasonable considering the cost of components. At the price of the ProMedia, no system can be perfect. Again, the system cost must be taken into account. Most stereo speaker pairs in the same price range as this entire amplified system do not sound as detailed, natural, or accurate as the ProMedia 2.1. In this case, a negative aspect must be seen as a positive, simply because of the price. Compared to most multimedia or inexpensive sound systems, the ProMedia 2.1 is remarkable in the quality of its music reproduction and the nearly seamless integration of the satellite speakers and the subwoofer. The Klipsch ProMedia 2.1 has been designed by a respected audio engineering company, with assistance and certification from Lucasfilm, to provide high quality sound to multimedia enthusiasts, an entire market segment that has been all but ignored until recently. This system delivers exceptional sound quality and excellent sound effects performance that far exceed typical speaker systems included with computers. This is not a high end system, but it demonstrates how good an inexpensive system can be, if the manufacturer spends more money on research and development than on advertizing. In fact, the ProMedia has blurred the line between low end and mid fi - which is it? That depends on whether you judge the system by its price or its sound. If the ProMedia 2.1 doesn't have enough speakers to suit your needs (perhaps you simply must have surround sound), Klipsch also makes the ProMedia 4.1, with a larger subwoofer, 400-watt, 5-channel amplifier, and four satellite speakers. Finally, for people who live in a small house or apartment on a limited budget, using a DVD-ROM equipped computer with a Klipsch ProMedia system as a basis for a home entertainment system could be a very efficient and satisfying solution. The ProMedia 2.1 is not a substitute for high end audio. If you are looking for a $200 system that will compete with Linn, Marantz, or Spendor, don't bother. While decidedly not "high-end" the ProMedia series of amplified personal sound systems has served notice that computer and multimedia sound doesn't have to be flat and lifeless and that inexpensive sound systems don't have to sound cheap. The first photograph used in this review courtesy of Klipsch. Many thanks to Mr. Joshua Ryan Hall of Klipsch, and everyone else involved, for providing the unit used in this review.